I’m getting used to the picky palate of my teenager, but I had begun to think that my husband D likes everything I cook. Not so, apparently. I let him sample this salad before I did, and his lukewarm reaction had me scared to try it, so it was lunch the next day before I worked up the courage to try a bite. And another bite. It was good–sweet and spicy, just the way I like my salads. The only things it lacked were some sweet bites of fruit and maybe some nuts for crunch. So I stirred in halved grapes and sprinkled the salad with roasted peanuts–and wound up gobbling up the entire bowl for lunch. D now claims that he would have liked it better if he’d had it with the grapes and peanuts, and he’ll soon get a chance to test out that theory because this recipe is just so easy and delicious that I’ll certainly be making it again. Next time I will probably use packaged broccoli slaw rather than laboring over both a spiralizer and a mandolin to grate the broccoli and carrots. 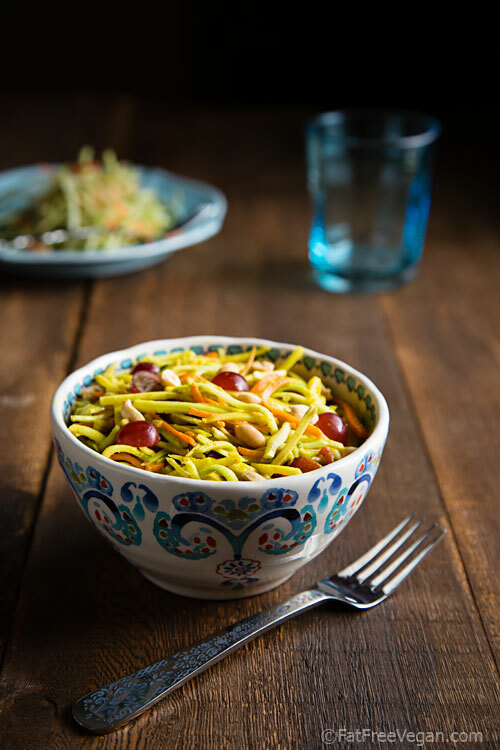 Freshly made broccoli slaw is definitely more moist and flavorful than the packaged stuff, so if you don’t mind a little mess and effort, I recommend you use either a mandolin or a food processor and save the spiralizer for larger, softer veggies. Just be sure you peel the broccoli stalks and cut off the bottom 1/2 inch or so to remove all the tough, woody areas before you start your shredding. A quality curry powder, such as Maharajah, will provide the best flavor. This salad sounds so good! I might leave out the red pepper flakes, because we do not like food that is too hot….but am going to try this soon! Thank you for sharing! What an interesting slaw. I would never have thought of that in a million years. It sounds really delicious. I am lusting after that first bowl too! I am a lazy cook. I would throw in a can of crushed pineapple, instead of separately putting in juice and chopped pineapple. 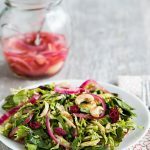 This looks absolutely fantastic–my kind of salad!! I will definitely try this out when I’ve got some broccoli stalks to use up, or when I have a package of broccoli slaw. I put grapes in my salad all the time. I am putting this on my “to eat” list!! I like all the ingridients so I think I’ll like it 🙂 So far I have only a partner T. to taste new meals and he likes everything, haha. I made the pineapple variant without the stevia or grapes and with chunks of pineapple and some red kidney beans. It was also very quick to toss together on a week night. 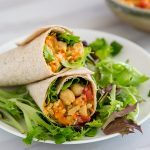 I ate it for lunches through out the week and each time it was delicious! I foresee it becoming a lunch staple. I just made this salad and absolutely love it! It is at the moment in the fridge (since I have to wait for an hour!) and even without the grapes and peanuts added in yet, I already loved the first taste. 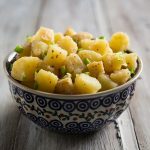 I love curry in salad dressings and this sweet and spicy combination certainly is a winner. My hour is up and I just ate a whole bowl of this delicious salad! I tastes great. The only changes I made was I didn’t use the sweetener in the dressing and my broccoli slaw had some shredded red cabbage in as well. The grapes lends a lovely sweetness and I quickly roasted some raw peanuts in a little pan on the stove and put these on top. Sweet and crunchy with some warm peanuts on top. What’s not to love? I will certainly make this very regularly now! Our household is not (yet?) fully vegan, but we are trying to eat a more plant based diet. Made this tonight and it was a hit with the whole family. Didn’t have pineapple or juice so substituted orange and a bit of lemon. Also used a bit of honey and some pineapple habanero dressing my husband picked up at Costco. Delicious! I tried this right after it was posted – and it has become my daily lunch. 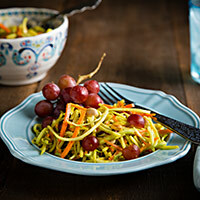 I use bagged broccoli slaw and it takes less than 5 minutes to throw together – perfect for work mornings. It completely fills me up for the long day but more importantly, it’s sooooo delicious. 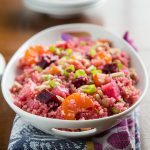 I am obsessed with it and have given the recipe out to so many people! Melissa, you don’t know how happy I am to hear that! Thanks for letting me know that I’m not the only one who loves this recipe. My local supermarket has fresh, store made broccoli and rainbow slaw. It’s much more tender than the packages. I’ve got curry haters in my house, so I made something similar. 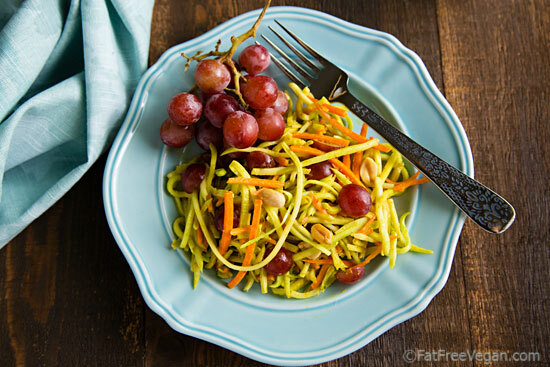 Rainbow slaw, thin sliced hearts of palm, avocado, dried tart cherries, in an orange sesame dressing. Well… Maybe not similar…but so good! I have made this salad a few times now. The first bite was underwhelming so I put it back into the fridge overnight. The next day it was amazing. It really gets more flavorful over time!! Love it. so easy and so good! I didn’t use the sweetener and of course had to put extra red pepper flakes in! But come on now: 4 servings? ha. 2 maybe. Of course I’m eating it as a meal, not a side dish! I wonder if tahini would work well to replace the peanut butter? I would love to take this to work but schools are peanut free. Any other ideas for replacing the pb? I think tahini would be a good substitute, but start with less because it may not take as much since tahini has such a strong flavor.